In part one of this series on Mental Toughness we introduced the “3 fights” you fight every day. The first fight is inside you. That battle is overcoming your fears, steeling your resolve, maintaining an offensive mind set, developing skills, knowledge and personal power, and not succumbing to mediocrity. The second fight is the actual engagement; the one most would consider the fight. You close with the enemy and engage in combat. You launch the product and steel yourself for the customer response. The Coach says 3, 2, 1 go and you launch yourself into the WOD. This is often the easiest of the 3 fights, and often the shortest in time invested. The third fight is between you and “the system.” Even if ambushed, an Active Duty SEAL who beats the crap out of an assailant in California will likely be suspended, perhaps his career ruined. The deep pocketed competitor lobby’s the Feds and you get investigated and shut down. The coach calls “no rep” and you lose the chance to compete in the Master’s Division at the CrossFit Games. The system can be downright cold and cruel sometimes. However, if you focus on the fight first and seek to win that before you ever embark on the second fight, or have to deal with the consequences of the third, you will win all three, every time. The first fight is in your mind. You must win in the mind, before stepping foot onto the battleground. This is true for any situation in life. The question, then, becomes how. You must master 4 mental toughness tactics to win in your mind before you step into the battles of life. Whether you are a SEAL candidate or business professional, the big 4 are your toolkit to mental toughness and success. Let’s look at the first of these tactics. Control of the breath is not just useful for arousal control, leading to a lessening of the effect of the negative impact of stress, but also in the positive sense it is useful to change your state even if the stress facing you is “simply” performance anxiety. 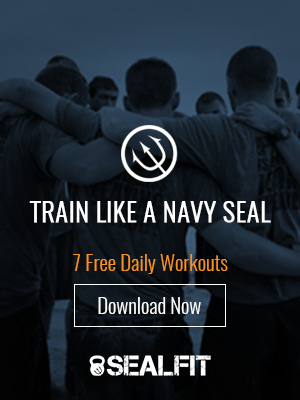 Elite athletes and Navy SEALs utilize breath control to prepare for missions and events. The act of psyching yourself up physically and mentally includes deep diaphragmatic breathing, forced exhalation breaths combined with powerful visualization and positive affirmations. We can practice a deep diaphragmatic breathing pattern through a discipline we call Box Breathing at SEALFIT Academy. Box breathing is meant to be done in a quiet and controlled setting, not while you are in the fight. The pattern is simply a box, whereby you inhale to a count of 5, hold for a count of 5, exhale to the same 5 count and hold again for 5. You can start at 3 if this is difficult, or take it up a notch if easy. You should be uncomfortable on the exhale hold, and be forced to fill the entirely of your lung capacity on the inhale hold. Until then, train hard, stay safe and have fun! Notes: Next 3 week Academy is July 9th to the 29th. Please enroll soon it is filling up fast! This program has not only helped me physically but taught me that the mental and spiritual aspect must be part of the process. That mind-body-spirit loop. I’ve started the unbeatable mind academy also. I believe with these programs that I can reach my goal of becoming a true leader- one that I would follow. That’s how all this began for me, I was tired of piss poor leaders and decided someone had to change so it began. I started to work on me, from the inside out. I always ran and worked out but this program is different. It forces you to confront the true you. Then if you have the guts to, put the work in to improving yourself. Read more recent testimonials at UnbeatableMind.com. Purchase this quality product at NavySEALs.com.